Those boxes are a chore to carry around for one person unless you make an effort of fabricating some sort of handles and straps. You usually have to dispose your box and obtain a new box for the return journey which is not always possible or convenient. On some airports you may be asked to open the box which will ruin all your duck taping. I wanted a bag, something without padding – sturdy but light. When I was almost ready to make a bag myself I came across an interesting product. It is a Body Bag from Ground Effect (New Zealand). It’s roughly 1650x750mm and allows you to keep the rear wheel and rack (!) on while the front wheel is tucked next to the frame’s main triangle. Zombie model on the left gives you an impression of the scale (bear in mind that this zombie is extra tall an dwarfs any bag). Bag weights 1.15kg and is made of heavy duty cordura and when not in use folds down to a size of a fat A4 book (in the photo below strapped at the front of the rear rack). My 29er XL Salsa Fargo (shortish ETT=600mm) just about fits and I can keep rear rack and mudguard on. Front wheel goes next to the frame and so does front rack, front mudguard and two small front panniers with clothes and food inside them. I also need to remove handlebars (zip tied to the fork leg) and saddle. Stem stays in place. If you have smaller frame you might get away with just turning handlebars and dropping the saddle. Conversely if your bike frame is more than 10mm longer than mine than probably it will not fit in this configuration, at least not with a 29 inch wheel at the back. Now because bag isn’t padded I use my Thermarest Ridgerest on one side and my small panniers and cardboard on the other. Also coming with the bag is spacer for the front fork protecting from squashing during transport. 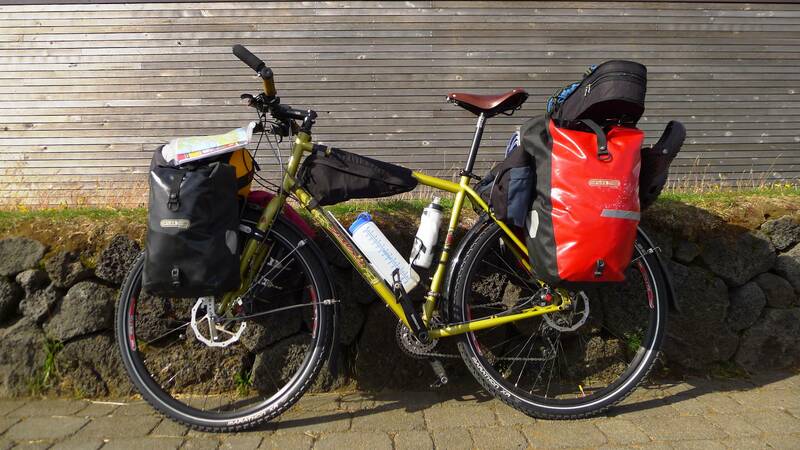 I pack all my other gear in two big rear panniers, tape them together and check them in as my main luggage. This strategy worked well during my latest trip to Iceland. The bag has shoulder strap for lugging around (hard work with 30kg of bike and food) and doubles as a robust footprint for the tent. Make the bag unzip fully so it can serve its tent footprint duties more efficiently. Make the bag 50mm longer to accommodate standard XL 29er frames with effective top tubes lenghts around 640mm. The bag has to be ordered from NZ as there is no distributor in UK (or Europe for that matter) and with shipping ended up around £60 which is not bad considering great quality and that there is not a single similar product on the market. I start cycling and immediately I’m stunned by the change of scenery. It is kind of warm but I keep all my clothes on, as if I’m waiting for sth to happen this morning… Soon enough I realize that following yellow posts marking the trail isn’t the quickest way to Askja and since I’m pushing the bike through the sand most of the time I might be just as well pushing it straight to the point. So I target Askja volcano and start walking… After two hours I don’t seem to get any closer, I constantly look back to check if my line is straight. It takes me about 5 hours of pushing to reach the mountain. I stop by the hut, unload the bike and, feeling weightless, I literally fly 10km uphill to see the volcanic lake on the top.. Main prehistoric caldera is huge at 50km² and the lake that fills most of it – Oskjuvatn is 220m deep. The small caldera – Viti, filled with hot turquoise water was formed more recently in 1875. I cycle back down to the hut and go to see the warden to ask about conditions in Kverkfjoll which is my next destination. She asks me about my name so I’m introducing myself and than weird thing happens… she looks at the map on the wall and asks – Where is Alan? I feel confused and surprised, I check my pockets and scan my bike like I could have lost sth in the desert. Then I look at the red pin on the map, there is yellow note hanging of it. Slowly my tired brain is starting to put facts together… Two days ago Alan and myself talked to the warden in Nyidylur hut, we left our names and information about the route we are taking. It looks like wardens communicate and really are tracking our progress here. I explain why we split and that Alan should get here 1 day later. She scribbles on the yellow paper. It’s getting dark and I have some more cycling to do. Road is very good and goes mostly downhill so I do 25km before pitching a tent somewhere in the far background of the image above. It’s Alan, British cyclist from Lake District. He is doing similar route to mine so we join forces and tackle some burgers in the next village. Alan expected to be able to get some supplies here before entering interior but all you can get is biscuits and some noodles. Being experienced trekker he makes a decision to continue on 2000 sugary calories per day! I give him one of my emergency nuts rations and we set off for some after dinner mileage in search for a nice camping spot. People who are smart enough to know which direction one should cross Iceland to avoid headwind. Panoramic break: And more smart people. We meet two French hikers. By the way we look totally badass in this picture, extra points go to Alan for holding one of his five a day! And one more smart German cyclist (heavy smoker who run out of cigarettes – very chatty) on a bike which most people in London wouldn’t consider robust enough for a 5 mile commute … Me and Alan waste a lot of time talking about bikes on every occasion. He rides Thorn Nomad with Rohloff hub and a funky set of DIY bags. In this company my Salsa looks almost like a road bike Good news – Alan has perfect bolt for my rear rack! More cycling or pushing if I’m seeing corectly! After 3 hour flight I’m landing at Keflavik International Airport 50 kilometers west from Reykjavik. 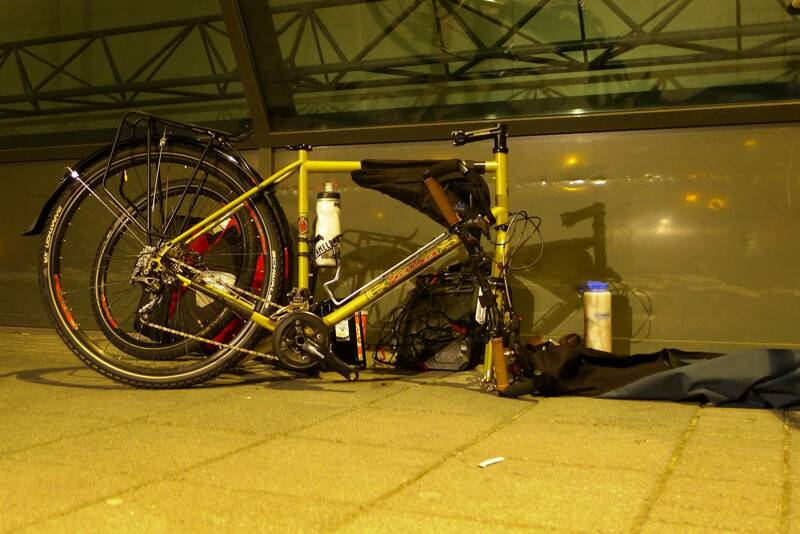 It’s 1am and I’m pulling my huge bicycle bag (full of bike & food) out of the arrivals hall. Weirdly, Keflavik Airport is a ‘bicycle free zone’ so I will have to unpack and assemble bike outdoors, not a good start this. It’s about 5 degrees so a bit chilly to fiddle with bits and bolts. Anyway, cat is out of the bag and ready to play. It took about 2 hours to assemble the bike and sort out all the bungee cording and since it’s 4am already and sun is rising, I’m dropping dull idea of sleep and just start pedaling…. Hard to believe that shot below was taken 5 minutes down the road from the international airport… now try that in Gatwick! I stock up on food in big supermarket and absolutely lovely bakery and leave capital slowly moving east. I never was a history person but early history of Iceland really caught my attention. So here comes lesson number one (there will be only two so listen closely)… long time ago a bunch of Viking lads got fed up with the oppression of nordic monarchy and decided to find a better place to live. They set off and while sailing to Faroes Islands accidentally discovered Iceland. Instantly in love with the fragile beauty of the landscape, they slaughtered bunch of Irish monks who at this unfortunate moment (unfortunate for the monks) were meditating somewhere along the west coast and took Iceland for themselves. It was 9th or 10th century and as a civilized folk Vikings already knew that monarchy doesn’t make any sense unless you are a king or a queen (the truth some nations will take forever to discover) so in 930 they founded a democratic parliament in Þingvellir. After this noble act the usual politics or killing brothers and getting married with your own children resumed so I will finish my lesson here. Enough history, here is the parliament plateau … behold the panoramic view of the Þingvellir National Park which came my way just in time for a lunch. Very, very long first day has come to an end. Nine hours saddle time and almost 150km on good asphalt roads. Warm. I camp on the abandoned farm, surrounded by horses.